The thought of making a budget or preparing your own taxes makes you want to collapse on the couch and binge watch your favorite TV show. It's understandable: Most people don't consider personal finance to be a fun way to pass an afternoon. 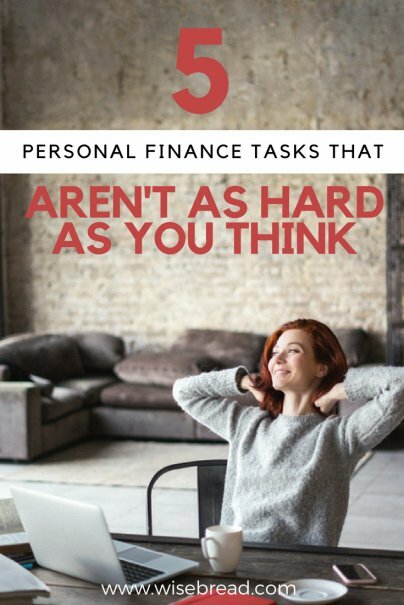 But the truth is, most personal finance tasks aren't nearly as difficult or time-consuming as you think they are. And if you muster up the courage to finally take them on, you can generate a nice financial boost for yourself. These personal finance tasks aren't as tricky as you think. Give them a go. You'll feel a lot less guilty when you waste three hours streaming old episodes of Battlestar Galactica. Drafting a budget is the first step toward making good financial choices. The problem? Making a budget sounds dull and difficult. The good news, though, is that it doesn't take nearly as much time or effort as many people assume it does. Simply list your monthly expenses that never change — everything from your mortgage or rent payment, to your car payment and insurance costs. Next, list those costs that change each month — such as your utility bill, transportation costs, and grocery spending. Put down an estimate for how much you think you'll spend on these items every month. From there, list the expenses that are more discretionary, such as eating out or going to the movies. Create a maximum spend for these items each month. Financial experts recommend that you have six months' to a year's worth of daily living expenses saved in an emergency fund. That way, if you face an unexpected financial emergency — anything from a $1,000 car repair bill to a job loss — you'll have money set aside and won't have to resort to credit cards. Building such a large emergency fund sounds intimidating. But if you take it in small steps, you'll find that building this fund isn't nearly as hard as you think. Start with whatever you can spare each month. If you can only devote $100 a month to your emergency fund, start with that. After a year, you'll have $1,200 saved. If you can save $200 a month, you'll have $2,400 at the end of a year. Drafting a will not only sounds complicated, it's also not much fun to think about. No one wants to consider their own death. But if you own property and assets, you absolutely need a will to make sure those assets are passed on to your loved ones according to your wishes after you die. How to do it? Start by titling a blank document with the words "Last will and testament." Then, state your name and write that you are of sound mind and legal age (this is usually 18). Name the executor of your will — the person who will carry out what your will states after you die — and name a legal guardian to take care of your children if you should pass away. Your will should include the names of any beneficiaries, the people whom you want to inherit your assets. Usually, this will be your children or spouse. But you can also name friends, charities, other relatives, or organizations. Finally, list your assets and whom they should go to. This can include your home, your savings, your car, or any other possessions. It can be tempting to hire an accountant or tax pro to do your taxes for you. The truth, though, is that most of us can do our taxes on our own. Taxes for most people aren't overly complicated. Things only get messy if you rely heavily on freelance income, write off part of your home as an office, or have plenty of deductions that you want to claim. Most taxpayers don't fall into that category. They can file their taxes on their own, especially with the help of easy-to-follow tax preparation software. Your bank just closed the only ATM and branch near you. Its online banking function is sluggish and frequently offline. You're ready to make a change — but you don't want the hassle of closing accounts and opening new ones. Here's the good news: Changing your bank doesn't have to be a hassle. You will have to do the research, of course. You'll have to find a new bank that has branches and ATMs close by. You might even decide to go with an online-only bank. Once you've analyzed your choices and selected a new bank, it's time to open an account. You might be able to do this online, but some banks require you to visit their office in-person. You'll usually need to make a deposit to start your new account. Once your account is open, you can transfer money from your old bank — hopefully you can do this online — into your new account. But don't close your old account too early: You want to make sure that any checks you've written recently have been cashed before you close that account. You'll also want to change all your automatic payments before closing your old bank account so that the payments are withdrawn from your new account. Many people have everything from their mortgage payments to their auto loan payments set up as automatic deductions from their checking accounts. Make sure you've switched all of these before closing your old account. And if your paychecks are direct-deposited to your old bank account, you'll have to make that switch, too.